This post is sponsored by Sister Schubert’s, but opinions expressed are my own. The holidays are all about family traditions. If your family is like mine, it just isn't Christmas without certain holiday traditions. Some traditions have stayed the same over the years - holiday baking (we've been making the same candy cane cookies since I was a little kid), watching Christmas movies, listening to John Denver's Rocky Mountain Christmas album (I still remember the exact spot the record would skip), my grandmother's cornbread dressing, and lasagna on Christmas Eve. We have started a few new traditions in the past few years - we ditched my grandmother's giblet gravy for a packet of gravy mix and turkey drippings (don't knock it until you try it! ), mimosa's while opening presents and Christmas breakfast at the Waffle House in our Christmas sweaters and Santa hats! 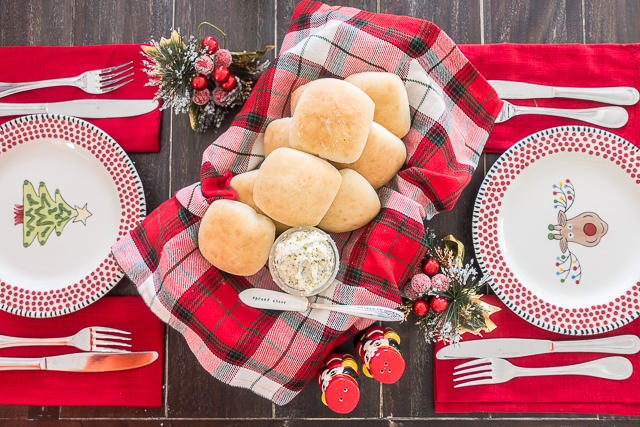 One holiday tradition that never changes is Sister Schubert's Dinner Yeast Rolls for our holiday meal. They are a MUST! Did you know that Sister Schubert's has been using the same recipe for five generations? If it ain't broke, don't fix it! 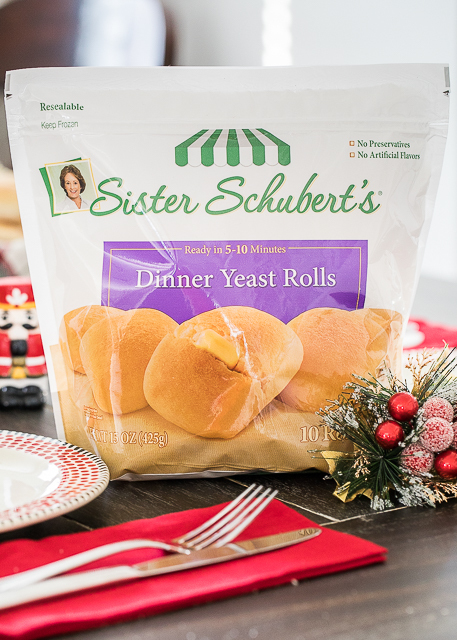 Sister Schubert's Dinner Yeast Rolls are frozen to naturally preserve the homemade taste of real ingredients and finished off at home for that home baked experience to show that everyone can have real, homemade tasting rolls. We LOVE Sister Schubert's rolls. Dinner isn't complete without a big ol' basket of warm rolls!! You can find the rolls in the freezer section at Walmart. The best part is that they are ready in about 5 minutes. Seriously can't beat that. We absolutely love them. They are great with our holiday meal and even better with the leftovers! My favorite is a turkey sandwich on a Sister Schubert's Roll - SO GOOD!! 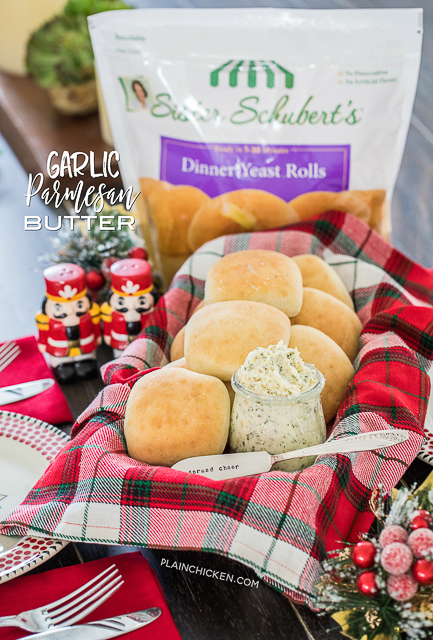 Sister Schubert's Rolls are good straight out of the oven, but they are over the top delicious with this Garlic Parmesan Butter. 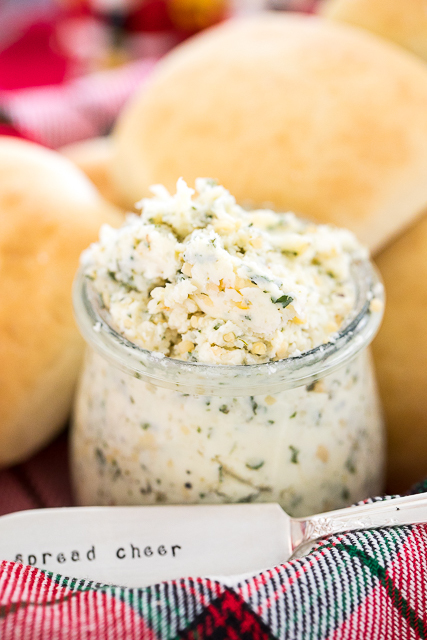 We make this Garlic Parmesan Butter every year to go with our Christmas Eve Lasagna dinner. Butter loaded with garlic, parmesan cheese and Italian seasoning. YUM! It only takes a minute to make. I usually whip up a batch while the rolls are baking. Lasagna, warm rolls and Garlic Parmesan Butter are our Christmas Eve tradition. 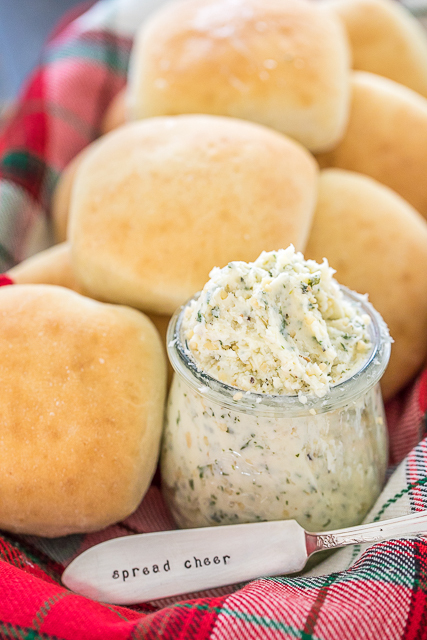 This Garlic Parmesan Butter also makes a great homemade holiday gift. The butter is super simple to make and everyone LOVES it! I like to put the butter in a pretty jar with a label and Christmas ribbon. The butter along with a pan of lasagna and a bag of Sister Schubert's Rolls makes a wonderful gift for teachers, friends and neighbors! It is a great way to share our holiday tradition with friends and family. In a medium sized bowl, combine all ingredients with a spoon or rubber spatula until smooth and completely mixed through. How long do you think this would last in the fridge? Just as long as regular butter?